The first General Convention of the Episcopal Church was held in 1785, 230 years ago. The 78th GC will start next week in Salt Lake City. 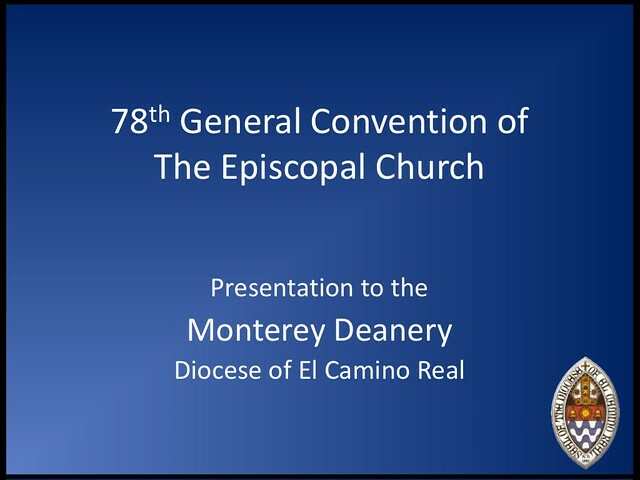 I was elected in 2014 to join the GC Deputation from the Diocese of El Camino Real (ECR). 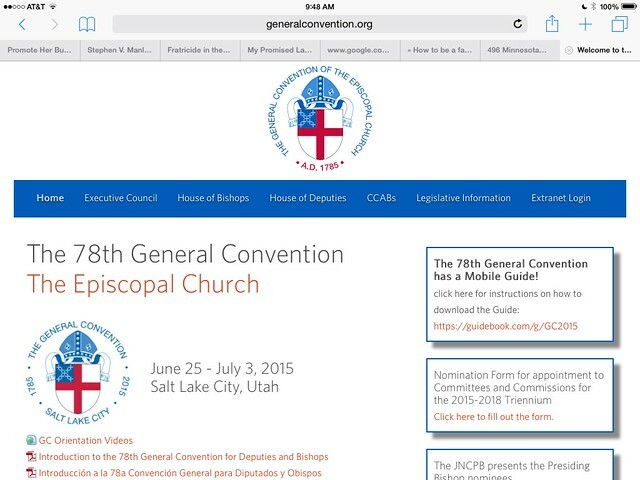 Despite being a lifelong Episcopalian, I have never been to General Convention before: I am looking forward to going! If you are a regular reader of my blog, you will know that I am an annual delegate and roadie for the ECR diocesan convention, usually held in Salinas, California. Last year, I felt called to volunteer two weeks of my time to attend the 78th GC. Since 2010 when I started four years of Education for Ministry studies, I have become more aware of the larger church outside of my own diocese. I want see how GC works, connect with like-minded folks in my church outside of Central California, and contribute my understanding and experience to the GC discussions as I can. 21 – Program, Budget and Finance 22 – Alcohol and Other Drug Abuse . . However, from the number of invitations I have gotten in recent months to dinners and receptions, I have learned that GC is not just a legislative body, it is also a meeting place for far flung associations, schools, and church interest groups to connect with alumni, supporters, and potential participants. So far, I have accepted invitations to attend our own ECR diocesan dinner, the University of the South dinner, and the reception for Education for Ministry (for which I am an Accredited Mentor). I am sure I will participate in other events as well. 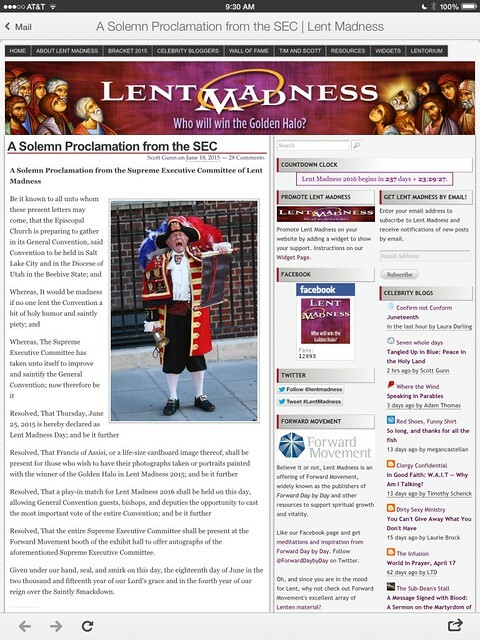 Any convention that can accommodate both the Lent Madness sillies as well as serious theological lobbyists is going to be very interesting indeed. 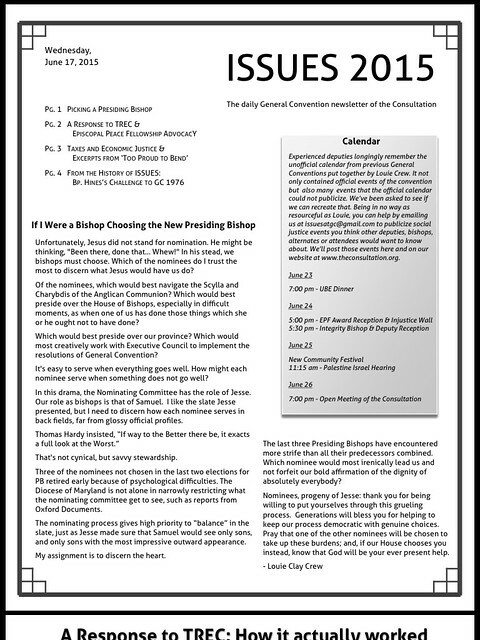 This blog post is also available on the RealEpiscopal.Org ECR diocesan website. Rev. Tom Sramek Jr. and I are the diocesan bloggers for GC 78.